and from now on, we will talk about development stuff there. So I invite anyone who is interested to involve in Choqok development and contribute code, subscribe to choqok-devel mailing list. Good news is that I received several comments and emails from people who would like to work on Choqok and keep it up. And I asked kde sysadmins to give us a choqok-devel mailing list, to use it for communication between Choqok developers. will announce it when it become ready. The bad news is that Twitter had a deadline for it’s version 1.0 API which Choqok is using now, that deadline is over. and from today (pacific time). Choqok stopped working with Twitter. I’m sorry for that, but fortunately we have someone(Daniel Kreuter) who is working on it right now, and this issue will be fixed soon, and we’ll have a release when its ready. so stay tuned. So, If anyone interested to work on either Choqok or Blogilo I would be really appreciated to help him/her and give away their maintenance. I know I wasn’t a good maintainer/developer because I didn’t find and prepare someone to fill my place after me, I’m sorry. Long time after Choqok version 0.6.6, Now I’m going to introduce you a similar notification solution for version 1.x series. It’s going to show you text content of post, to you. instead of just telling you how many new posts you have. By default. notification is positioned at top-middle of your screen, you can change this, by selecting “Adjust notification’s position” button, and then you’ll see a fake notification, that you can re-position it easily. Don’t forget to select the Ok button (that blue tick) on fake notification to store your desired position. If you just close the BetterNotify configuration dialog, your position won’t store on disk. If you click on the close button, it means you are ignoring notifications for now, It will close this notification (unmarked) and won’t show other notifications currently in queue. And the most important one is what you see under configuration dialog, You have to disable plugin, click on Apply, and then re-enable it, after changing it’s settings, to take effect. or they will take effect after Choqok restarted. 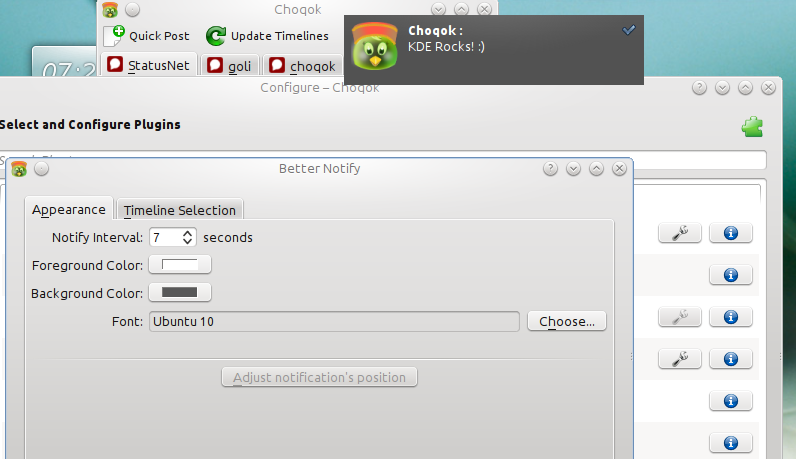 One more tip, This plugin won’t disable Choqok’s notification of new post arrived! 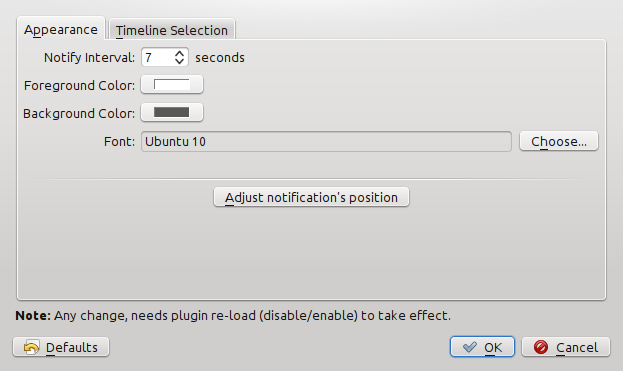 You have to disable them in KDE or Choqok notification configurations. I hope to release it at last week of June. Or, you can get Choqok from git, and try this new plugin and report back it’s bugs and your thoughts about it. 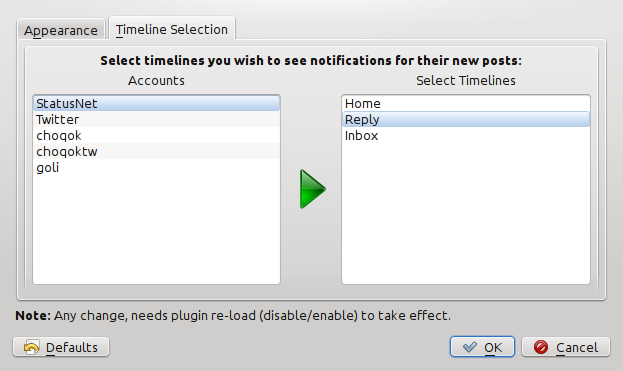 Why did we not use KDE notifications? Twitter is forced its new permission level from today, first of July. So, Choqok users who want to see and send direct messages should re-authorize Choqok to access their direct messages. Here you can read more from twitter blog. Twitter said that current authorization level (Read/Write) can send direct messages. So, If you disabled sent and received direct messages timelines in Choqok, and you don’t need to access them from Choqok, Its OK, you can continue with current authorization. Tencent Weibo is a Chinese microblogging website launched by Tencent in April, 2010, and is still currently under beta testing. Users may broadcast a message including 140 Chinese characters at most through the web, SMS or smartphone. And today, accidentally I discovered that “Oasis Li” developed a microblog plugin for Choqok to support this microblogging service. Here you can find the source code of choqok-tencent plugin. and here he wrote about how to build and use it.